A rich, Michelin star worthy dish! This potato recipe demonstrates how you can really spruce up with simplicity. 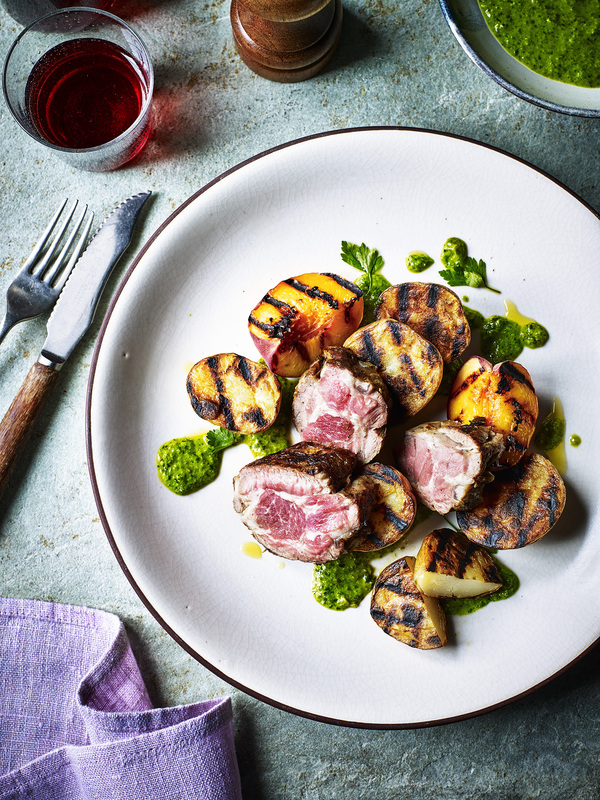 Here, you'll experience the delectable flavours of lamb mingling with the fruity taste of peach delightfully flavouring the potatoes in turn too. Cook the potatoes in boiling, salted water for eight minutes, until soft but still holding their shape. Drain. Char on a hot griddle pan until starting to blacken on one side. Remove and set aside then char the peaches until starting to soften and pick up the grill marks on the flesh. Blend the parsley, oil, garlic, capers, and mustard until coarse. Check the seasoning and add more if necessary, loosen with 1-2tsp water, then set aside. Heat a griddle pan until smoking hot, season the lamb well, brown all over then cook for a further few minutes on each side. Leave to rest for five minutes. Slice and serve with the peaches, potatoes and sauce.